Dachshunds are natural barkers. Descended from a strong line of German hunters, the dachshund instinctively barks to alert its master to potential prey or to a stranger on the premises. Your dachshund may think it rules the house, the yard and even the street, and may bark at anything that moves. This is annoying for most dachshund owners, but a few training techniques may help solve the barking problem. In addition to the annoyance, prolonged barking may cause physical problems in this breed as it stresses the lungs, the throat and the chest region. Eliminate the cause of the barking. Remember your dog's bark was useful during hunting forays because it alerted its master to the presence of prey and it confused the prey, sometimes leading to its demise. Don't try to stop your dachshund from barking once or twice to alert you to a stranger, but teach it to stop barking upon command. Issue a "No Bark" command and put your dog in its crate if it keeps barking at a guest that enters the house. Say the command one time, sharply, and then pick it up if it continues. If it barks while in its crate, cover it with a towel or a sheet to obscure its vision of the guest. Put up a barrier if your dachshund barks when looking out the window at the neighborhood beyond. Hang a curtain, close the door or move the couch from in front of the living room window so it can't see the object of its barking. Bring your dog inside if it is in a fenced yard and barks at neighborhood children or a cat. Issue the "No Bark" command and give it a few seconds to quiet down. If it doesn't, carry it inside without saying another word. Avoid scolding your dachshund. Constant barking is annoying, but it is unlikely to learn the association between the "No Bark" command and its behavior if you say anything else. Be persistent. 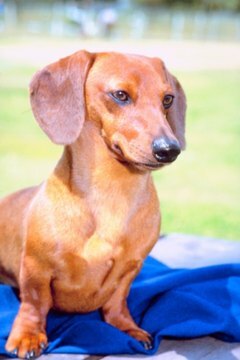 Dachshunds are persistent in their stubbornness, which is a breed trait, and it takes patience and commitment in order to help your dachshund develop better habits. Reward your dachshund with a tasty treat when it obeys your command to stop barking. Keep a container of favorite treats handy and offer them only when it obeys you and stops barking. Don't offer them for any other reason. Your dachshund will learn to associate the favorite treat with obeying you. Allow a few barks of happiness from your dachshund when it sees you and when you are playing. After all, it is a dog, and dogs bark for many reasons. Only inappropriate barking should be deterred. Keep a number of chew toys on hand to occupy your dachshund if it barks out of boredom. Why Do Coyotes Howl in Packs? What Does It Mean When Your Guinea Pig Barks?